What cell phone should I buy? – The VX7000 has a nice long standby time; I can usually go a week between recharging. – I really like the LG menu and user interface system; I prefer it over Nokia and Motorola phones that I’ve had in the past. – The phone isn’t huge; I usually slip it into my pocket and keep it on silent vibrate. – The camera on the VX7000 is pretty dated though (only 640×480). – I don’t tend to text message or surf the web that much, although I might surf the web more if I had a phone with a keyboard or a high-speed/always-on connection. – Verizon’s voice quality is good. – Verizon’s customer service has been great in my experience. – This is just my personal opinion, but Verizon doesn’t seem to interoperate well with Google apps, whether it be an inability to receive SMS messages from Google calendar, an inability to run Google Maps for Mobile devices, etc. I’m willing to leave Verizon regarding this, if I can find a carrier with more support for how I work. – Verizon’s coverage seems non-existent in Eastern Kentucky whenever I visit back home. I pretty much want 1) a phone that stays charged for a long time 2) with a pretty good camera. I don’t tend to use PDAs much, and I don’t need Bluetooth or calendar/address/contact sync’ing. I’d prefer an LG phone for now. The LG V looks interesting (it has a keyboard). Except of course that if I stuck with Verizon, I wouldn’t be able to use many of the neat features. With email, Verizon mentions support for Hotmail, AOL, and Yahoo, but no mention of Gmail (see below). And in the same way, Verizon mentions IM support for AOL, MSN, and Yahoo, but not for Google. Sigh. Should I just give up on Verizon? Has anyone else been able to get Verizon phones to work with Gmail, Google Talk, Google Calendar, or Google Maps for Mobile? So, what phone and carrier do you think I should try next? Why do posts get lost if you don’t answer the captcha? You used to be able to go back, and resubmit. I like blackberry 8700g with t-mobile or cingular with gprs and edge data support it rocks! Goog maps kills on this device, you have qwerty and email is outstanding. No camera – all phone cameras are second rate and add unecessary bulk. I don’t recommend what I use – a Sprint Treo 650. Pictures are NOT good at all and Sprint has too much support for Ringtone scams. Connectivity is just fair up here in Oregon for internet use, better down in your neck of the Silicon Woods. My friend in Bay Area just got a Verizon Treo 700, is very happy with it, and his Treo takes good pix. Great post! Alerting the people to the use of Google Apps on the mobile, the wise choice for mobile and operator in a week when Google announced some new stuff on that segment. Whatever you do, don’t get the Razr! It’s a piece of Ish. I’m upgrading to the Q. My friends that have it say great things. But you might want to wait. I heard there was a black version on the way. I bought a Nokia 6270 off of eBay for use with Cingular, and I’ve gotta say, it’s awesome. 2MP camera (with flash, but the flash isn’t very useful), video, internet, speakerphone. I’m also getting a lot less calls dropped than I did with the razr. Not sure why you don’t like the Nokia UI. I find it very intuitive. I use an cool little app called Shozu to upload pics straight from the phone to Flickr. Google Maps works like a charm. Cons: The phone is a little on the big side. About as big as the Palm Treo. Not un-pocketable, but not exactly “slim” either. Perhaps this will help. It’s an interactive mosaic showing all the cell phones I could find on Amazon. My Treo 700p treats me well, and I’m able to use Bluetooth and Sprint’s EVDO connection to get wireless broadband anywhere. I’m very pleased with it. My best friend has this little bad boy and it’s not too shabby. Takes decent pics and it’s pretty durable. I dunno about the rest of it though (specifically Google interoperability). All my buddy ever does is takes pics and makes calls. Don’t get any of the Nokia ones, whatever you do. A few people I know own Nokia phones and they have a tendency to wear out buttons. I just dropped cingular for verizon because where I live verizon has better reception, now I am looking back all all the cool phones and features cingular is offering. My head hurts when I try to dig into all this stuff, no time for it. Let us know what you find Matt! I originally wrote a long reponse and then just as I hit the submit button I noticed that the captcha was not filled in. I wasn’t too worried as you have always been able to go back, fill it in, and then simply repost the same message. But no, not tonight. That does not happen any more. What happens now, is that the message box is completely blank. Verizon typically cripples the hell out of their phones and always over charges for them (IMO). If you are buying a phone with the contract subsidies, I’d avoid Verizon. I’ve been doing GSM since I started using cell phones, mostly with Cingular. I’ve been pretty happy with them. They typically carry a few uber-geeky phones (and they do have some LG phones now) and most of the phones I’ve wanted have been at least tri-band GSM (though, you’ll want to make sure whatever phone you get works on 850 and 1900 frequencies if you do Cingular). To boot, Cingular is really big in the South. On trips back home to Alabama, unless I’m in my parents house, usually have full signal. I can’t vouch for which part of Kentucky you are in, but on a trip Louisville awhile back, I don’t think I had any problems making calls on the drive up from Birmingham. If you don’t care about the subsidies, I’d put the phone before the network. While you mentioned not liking the interface, I’d still suggest taking a look at the Nokia N-series phones. I’ve been eyeing the N-80 for awhile. Since Symbian is such a popular OS, it’s likely that you can find Jabber clients. The N80’s browser is based on Apple’s web kit and will probably work well with the Google PIM stuff. Not to mention the N-80 has WiFi built in, which will be nice when the greater San Francisco area is one big hot spot. I know it will work with Cingular. I don’t know / don’t remember / can’t look right now to find out about Verizon, etc. But I’m sure you’ll do the research if you are interested. The Motorola RAZR is nice. I also find that I get better reception with motorola phones than with the LG phones. Maybe you should just fix the Google apps? Whether the SMS works seamlessly or not, I’ve never had a problem with regular email on any provider. With that said, I was with Cellular One -> AT&T -> Singular for over 10 years and finally dumped them for Sprint because Sprint had better coverage between Sacramento to Reno and on to Fallon, NV. If you travel a lot in So. Cal in the desert area you better stick with Verizon. Doesn’t Verizon cripple all of their phones? If you search Howard Forums, you’ll find a bunch of people flashing the Razrs with Alltel’s flash to enable what Verizon disables. I have a Razr with Verizon and got the Motorola Phone Tools CD for it. Motorola says that half of the stuff won’t work on Verizon phones because of what they disable. Verizon will be getting cancelled shortly when I go back to Alltel–probably with a Treo or Blackberry. Get the Treo700m! I have the 650 and I love it, it’s the most amazing phone I’ve had yet. 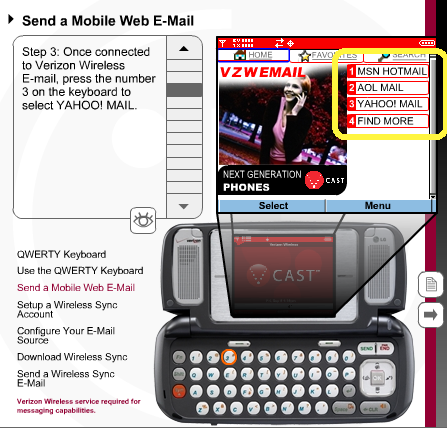 I have a Razr V3m and it works great with my gmail and gmail for domains accounts. I also use Google local search regularly. FYI – All new Verizon phones now have the same menu system, so it doesn’t really matter if you get an LG or another brand. moto Q looks very good, I think this the one for me! I’ve recently bought a i-Mate K-JAM (not sure what carriers they work on in the US). It’s really very good. Built in keyboard and fully featured pocket pc. It’s also just about the right size that it will fit in your pocket and you can use it like a normal phone (my previous PPC phones have always been too big, requiring a bluetooth headset). Being a PPC you can use it for browsing the web, RSS feeds, email (good with built in keyboard) and storing MP3s/podcasts and videos (if you get a big enough SD card). Matt switch to t-mobile and get the Blckberry 8700g. My understanding is that the trouble with cell phone cameras is a matter of optics and focal distances and so forth, and higher digital resolutions don’t help all that much. While many will likely disagree with me, but avoid the RAZR. I have one, and while it is durable, the interface is not very friendly or intuitive. I also have come to dislike the keypad. It is easy to hit the wrong key. Oh, and the predict typing when you are typing a text message requires you to delete the entire word if you hit the wrong key mid-word. All in all there is a lot of little things that I dislike about the phone, but not any the are so big that I felt compelled to get a new phone ASAP. I will, however, be getting a different phone in the near future too, so let us know what you get. If you want a phone, get a phone. If you want a PDA, get a PDA. I’ve had the sidekick and blackberry models. They are fine, but bulky and I really found myself feeling rediculous talking on something the size of a laptop computer in public. I now have a RAZR, it operates as a phone just fine, is very thin and light weight and I don’t miss having a qwerty keyboard or other fivolous features. I’ve been thinking about maybe T-Mobile and a Sidekick 3 as T-Mobile is the least obnoxious carrier from the word-of-mouth I’ve heard so far, and I really like the Sidekick 3 form factor, but I’m having some hesitation about it since Googling for “sidekick 3” “os x” gave some bad reviews of the Bluetooth and Synching functionality for the phone. I’d really like to be able to use the phone as backup connectivity for my laptop. Although… what I’d like to see most in a phone at this point? GAIM. I’m wise enough to realize that I’d probably use the phone as a modem like maybe 3 times total, but a full-blown GAIM installation, THAT I’d use constantly. All that said, I’m in no rush. My phone works and it’s not free-phone-ugly, even if it’s true that I don’t like Verizon and even if I’m paying a bit too much at the moment. So yeah… If Apple bothers to release a phone anytime soon, hopping onto a new Sidekick 3 is likely something I’ll regret. But I’d really curious what everyone’s thoughts on the subject will be. I’m with T-Mobile for quite a while and very happy with the service they provide. For Kentucky the coverage is decent since T-Mobile offers 850 Mhz roaming coverage in most areas. You need to check out the new LG CU500. I have been using one for the past month and its one of the best phones I have used. I had been a long-time Nokia fan for their UI. It operates on the 3G network which means it has fast web browsing, HBO, CNN, etc. It also doubles as an MP3 player with a flash card that can handle up to 400 songs. The music player buttons are on the outside as well. The topper on the player is that it has stereo blue tooth, the coolest thing. It has a decent 1.3 megapixel camera that is also takes videos with sound. The other neat thing, coming soon they say, is video share which allows you to broadcast a live video stream while you narrate the video at the same time. I have not used this yet but it sounds cool. It looks a little like a RAZR (stay away from them unless you like returning it to be serviced). This is my first LG and I think they have a winner. Out here in Asia all you do is buy a SIM card, and then stick it into any available phone. So if you want to stay trendy, it’s easy to upgrade your phone as often as you like. Just ask my wife… Although you can roam with a SIM it’s expensive, so if you travel int’l a lot, you can buy a SIM for each country and pop it in when you land – with two notable exceptions – Japan and Korea which don’t use GSM. Perhaps this is why Europe and Asia mobile phone services are so far ahead of N Americans. Motorola Razr is a great choice and the LG chocolate! Matt, try Cingular. they’re the only one I’ve found that doesn’t go out on me in a particular section of I-75, and the only one that works up near Michigan’s UP. if you want to make your verizon work with google apps, just have it email 3135551212@vtext.com or whatever your number is… that’ll send a text message to your phone. It’s a cludgy workaround, but it works. As of built in camera, my wife just got the Sony Ericson K-800-i with a 3.2 mega pix cam and yes, at least here in switzerland, she can read gmail and stuff like that. Not sure if you still have your built in SIM-Cards in the US or not. Anyway, I’m sure you do a wise choice. i guess for a geek like you, that is the right toy, it includes a full keyboard and PUTTY! .. 2) with a pretty good camera…. oh, i missed that one… the E61 comes without a cam, but i prefer to use a seperate cam (ixus) for better results anyhow. The E61 has really EVERY flexibility you need, whatever email provider you use. It has power on heavy duty for 3 days, 7 if you do not use it much. You may use a bluetooth camera to exchange pictures with the phone, by the way! I’m in Lexington and Verizon works very well here. Not sure about the eastern part of the state though. Heh, it’s so funny watching you guys discuss phones and networks. Knowing I’m in Norway where we have two networks. Both are very good these days. And the choice of GSM phones is just SO much better here. You only have to worry about the math captcha when it asks to divide a number by 0. I keep telling it undefined or not a number and it keeps kicking me in the hind end. I would like to be able to help with your choice of a new wireless phone type gadget,. I really would. However, after all of the on call years I refuse to even consider yet another leash. Good luck on finding something. 8+9 apparently doesn’t = 17.
can’t be bothered typing all that out again… I basically said get a razr if you just want to call and text. I wonder if 4+4=8 in blog land. The Nokia’s are also good phones, here in Europe most people have Nokia, SonyEricsson or the Razor V6 (forgot what company), and in my experiance all other phones have terrible user interface, quality and capabilities (although usually more expencive, but here you get the phone for free if you’re on a contract). Check out this show (#8 With Anina) to find out more about mobiles etc., very interesting, you’ll love it. Great post Matt, my plan with Verizon is up in December! Personally, I wouldn’t switch because of reception. I’ve been with AT&T, Cingular and Verizon. They’re all lacking, but Verizon seems to be the best. Oops. Neglected to see the website was already mentioned above. Apologies for the double post. The camera is pretty good. After saving a picture I can send directly to my flickr account and have actually set up a set just for photos taken my the camera phone. They are sometimes a bit dark for indoor shots. The flash that comes with the phone isn’t that great but it does it’s job. The Keyboard has come in extremely handy, since I txt message often. I would recommend you stay with verizon and get the LG V.
Well, Matt – you looked pretty excited when you saw my toy at Boston. Surely it MUST be in the States by now? It’s REALLY cool with Skype for mobiles loaded! free calls within a wifi connected zone and data only charges on 3G. And Cingular will change the details of your plan without telling you. I went to Cingular because they had unlimited data for $20/month. They got rid of the unlimited data and are holding me to my end of the contract telling me their not bound to the terms of the add-ons – only the primary plan. It’s a huge scam (IMHO). It’s been a while since I looked at phones, but I can say that I love the interface on my Sony-Ericsson (sp? ), but my partner hates his Motorola. To me the UI is a big part of the phone… Don’t assume anything – pick up the phone and try out the interface. i have a razr and it’s okay. maybe google and verizon should collaborate (isn’t that what y’all are all about?) and make a version of google calendar agenda that includes ALL calendars, not just the primary. i get my agenda emailed to me and i can read it in gmail on my phone…but it doesn’t help because i can only see my primary agenda (and i have 6 or 7 calendars…. I have Cingular. It is prolly the most well-rounded carrier I’ve experienced…The’re not necessarily stars at any one thing, but everything works OK…Plus Rollover is a GOD-SEND!! (Best thing since sliced images in ImageReady) The only thing is they don’t necessarily have the absolute BEEEST phones out there…but for the most part they’re not bad. Please be sure to let us know what you got because I’m in the market for a new phone as well and I have some of the same concerns as you. I would reconsider your statement that you don’t need bluetooth in whatever phone you buy. As of last week it seems very likely that it will soon be illegal in CA to use a cell phone in your car without a handsfree device and a bluetooth headset is a great improvement over wired headsets. I tried 3 or 4 different wired headsets when I bought my last phone and was displeased with all of them. Then tried a bluetooth headset from Motorola and I love it. But maybe you’re one of those smart fellas who doesn’t use their phone in the car. Hope you had fun at the Art and Wine fest, a couple co-workers were there and said it was a great day for strolling. Love my Motorola Q. Works very well with Bluetooth headset. Only drawback is battery life. I need to recharge every night. Go the whole hog and get the Sony UX180P – Sony will give you an unlock code if you don’t want to go with the Cingular SIM – you can do most of your calls/video calls on Skype possibly saving money. Only problem is sticking it in your pocket and getting it to vibrate. You also better visit the optician to make sure you have an up-to-date prescription in your goggles. I should disclose that I work for Verizon, though I’m very distant from the Wireless division, so I’m not just trying to push the company line. Besides, Verizon’s divesting themselves of my part of the company anyway, so within a couple of months I won’t be working for Verizon anymore. Matt, I have the LG V, and although I thought it was fun at first I Have found some things lacking. The good: The ability to text on this device is outstanding. Text messaging with this phone is so easy it has become one of my main methods of communicating. The network is outstanding, I never drop calls. The voice clarity is good, the MP3 player is a fun feature (that I never ever use) and it attracts positive attention when I flip it open… people think it’s a mini laptop. Matt, go with the Black Diamond. besure to check out the price tage…ouch. First, stay with Verizon. I continually hear how they’ve got the widest broadband network — not from them, but from various reviews testing things. Once you’ve got broadband on your phone, you never want to go back — or discover you’re knocked back to 1X. Next, well, I like my little XV6700 but can’t recommend it to everyone. It’s sluggish, tends not to do things like let me answer calls quickly (stuff you’d want a phone to do). But I find it a useful combination for not having to carry around both a PDA and a phone, plus the QVGA screen is great. I did love the Treo 700W, especially the keys, but the square screen is a real drag compared to a rectangular one, if you’re doing some web surfing. Sure, you say I won’t do that much on my phone. But then you get a broadband phone and away you go. Rand’s got the Q, and I was ooohing and ahhhing when I saw it. Very, very nice. Very thin for all it has. But no touchscreen. I really like a touchscreen, and I really tolerate a slightly bigger device for having a proper querty keyboard. If only — IF ONLY!!!! — they’d have given the Q both. It would have been great. But you’d probably get on with it well, Matt — despite it being a Windows Smartphone. And then maybe you could go Gmail with it and find out annoying it is that Gmail won’t let you shift easily out of mobile mode in a Smartphone and get tickboxes to delete all your spam. Another thumbs up for the Sony Ericsson – they’re rapidly re-inventing themselves as the Apple of the mobile phone market, I reckon. The battery life is great at first (though after a year mine has dropped quite a bit, time for a new battery I think) and it charges very quickly. The camera takes great photos in daylight, and it has a bright halogen light/night mode for night time shots. Great UI too. I’ve been using GSM phones with Cingular for awhile now and I really like it. Really handy when you’re in Costa Rica (or pretty much anywhere else in the world) and your phone just works on the same phone number you always have. Supposedly Nokia E61’s are popular at Google? Sprint Dude. Get their copy of the Razor or a more high tech one. You travel a lot and they wrok in all populated areas – you can pay $5 extra to have unlimited roaming….plus they have air cards for internet access that work great…. You may also consider to select from decent varieties of Nokia at their flagship store in New York, at 57th Street,Fifth Avenue. Get the nokia n80, it’s one of the best phones right now. Also, check out my blog @ http://www.marketingcard.com, it’s about SEO as well. I was looking at Verizon but was going to check out MetroPCS to avoid going over on my min. They don’t have the best phones. I was thinking of getting the Razr but not after it bashed in this blog. I was thinking of going with Verizon’s vx6700 for the wifi but Verizon told me I would be charged per kb for using the wifi on my home network, this seems crazy if I own the phone and the wifi network why should I be charged? I love the V with Verizon and am pretty happy with the pictures and flash works right on my phone. The camera as option for nightmode too. I just put it on largest image size then email to my self and shrink down with Photoshop. The MP3 player is GREAT! with wonderful sound quality. So far I have 10 albums of music and with memory card will hold about 500 songs. For Verizon in general you have to love VZ Navigator. It offers voice turn by turn and more. Any blackberry I think is great. I am a big fan of them. Thanks for the post. For me I mostly prefer HTC – it has 3G. I just wondered why nobody has mentioned it here..
Well I would advice anything from Nokia only I think has some great Cell Phone sets. Ok Matt, cell phones are my forte, I have personally tested the Sony Ericsson P990i and the Cingular 8125 (HTC, up-coming Taiwanese manufacture, very successful and long-lasting quality products), I have chosen the 8125 for myselft but either one of the phones will assure productivity and accessibility on your end. As far as batter, uhhhhh sorry can’t promise much there cause you know there is a give and take to everything – than again, looking at your expectations in a cell phone, you probably only need a cell phone, not a gadget phone. oh and the service is better to atleast for me verizon 15 dropped calls in 10 min in my room helio uses sprint towers i think are better .